Expertly handcrafted with luxury features, the Amish Rivertowne 48" Desk makes working at your desk delightful. This compact desk is perfect for home offices, bedrooms, dorm rooms or hallways. The Rivertowne is a single pedestal desk that holds one hanging file drawer, one storage drawer and one central pull out drawer to hold your laptop. This solid wood desk is Amish made in America and is part of the Berlin Office Collection which offers a one year manufacturer's warranty on their solid wood desks. Rivertowne style is simple and strong; this is a desk you can rely on for decades. 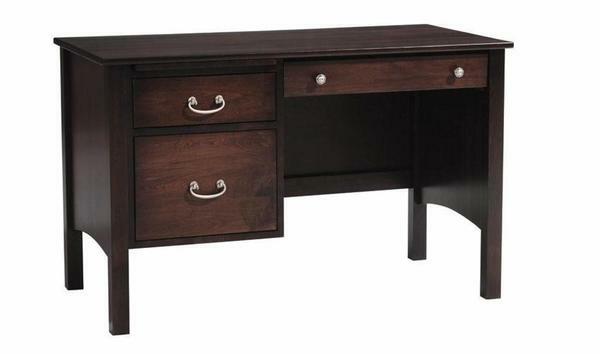 The Rivertowne 48" Desk is shown here in brown maple wood with Onyx stain. Brown maple wood features a smooth wood grain, making it an ideal choice to show off paint or dark stains.